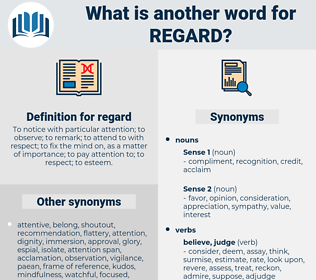 What is another word for regard? To notice with particular attention; to observe; to remark; to attend to with respect; to fix the mind on, as a matter of importance; to pay attention to; to respect; to esteem. responsibilities, Standards, respect, linkages, results, priorities, Activities, Goals, Visions, Relating. Criteria, data, Las, Lis, respect, direction, meaning, disregard, deference, standpoint, vein, side, order, particular, front, viewpoint, attitude, score, refers, recognition, conjunction, Relating, appreciation, angle, regardless. addressed, recognized, reflected, incorporated, included, written, given, expected, Had, paid, Accounted, considered, Counted. believe, perceive, think, saw, refer. considered, Considering, respect, believe, perceive, think, disregard, refer, Relating. dishonor, need, disdain, disadvantage, opposition, ill repute, hatred. negligence, carelessness, disrespect, dislike, disinterest, inattention, heedlessness, disregard, thoughtlessness, neglect, indifference, ignorance, hate. disfavor, scan, insult, disillusionment, deprecation, distance, discontent, glance, dig, blink, dissatisfaction, severance, indignation, animosity, disappointment, alienation, disenchantment, Oeillade, disgust, loathing, aversion, revulsion, sight, enmity, disapproval, peep, coolness, peek, divorce, gibe, estrangement, flash, browse, glimpse, Stime, taunt, detestation, disinclination, condemnation, disgruntlement, separation, displeasure, ogle, abomination, nausea, unhappiness. ignore, disbelieve, forget, miss, look away. Both were kind to me, and both seemed to regard me with more interest than usual. I know I always feel that with regard to Nuneaton. raw recruit, recreate, recruit, rice rat, rearguard, Raja Radiata, reassert, record, reassured, re-create, Richard I, ragwort, required, regret, rough-haired, ricardo, Richard Iii, race riot, Richard Ii, racecard, resort, rose-red, rag gourd, rose-root, recorded. affection, heart, tenderness, warmheartedness, Philia, affectionateness, warmness, fondness.